This Italian Kosher restaurant is seriously legit. 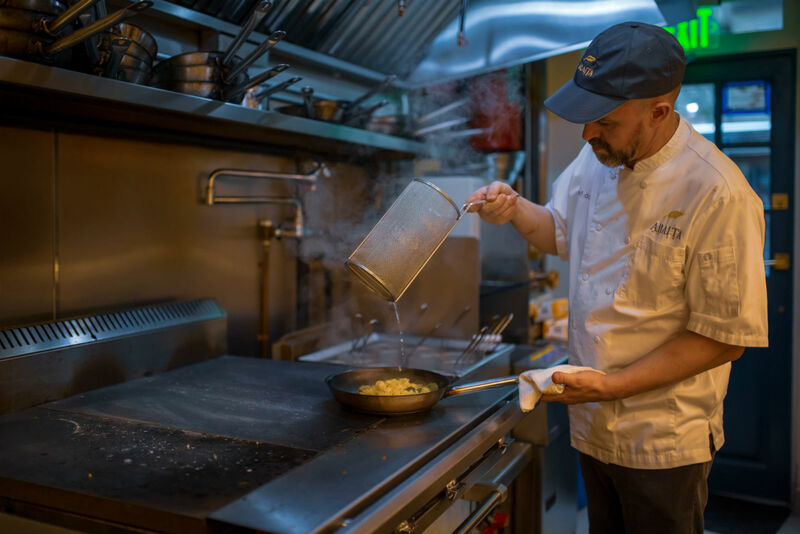 Chef Egidio “David” Donagrandi grew up in Northern Italy, where the Suisse and Italian mountains meet. The scene is something out of The Sound of Music, with rolling greens hills, a bright blue sky, and the most beautiful cows you have ever seen. David’s father was a butcher, his mother was a cook, and a deep love of food, the land, and the best ingredients was ingrained in him from the youngest age. His love of food and cooking eventually led David to New York and the restaurant business. His first restaurant, a Mediterranean-focused eatery called Paprika, was located in the East Village and had no Jewish or kosher connection whatsoever. Which isn’t surprising, considering Donagrandi didn’t grow up with a Jewish food tradition. These days, this Italian chef is running a kosher Italian eatery in Midtown. How’d that happen? When I asked him this recently over lunch at said restaurant, he humbly pointed to his Brazilian-Jewish wife, Hannah, sitting next to him. Hannah didn’t understand the impact she would have on David’s professional course and personal identity when they were first courting, but her own Jewishness and the fact that she kept kosher deeply impacted Donagrandi’s increased interest high quality kosher culinary experiences, and Judaism too. David ended up converting to Judaism and, as they say, the rest is history. Abaita, which opened in May of 2018, is the brainchild of Chef Donagrandi, Hannah, and Chef Sruli Subar (who is Jewish). Abaita, Hebrew for “at home,” is a fitting name for a restaurant that focuses on simple cooking prepared at the very highest level. The name also works on two levels: In the Italian dialect of Chef Donagrandi’s childhood, “baita” means “little house or little mountain hut,” and so the dual meaning is doubly significant. Chefs Donagrandi and Subar met over five years ago while both working as private chefs. Both passionate about elevating kosher cuisine, the two chefs decided to create a “deeper movement” in the industry by opening their own space. And they are doing what most kosher restaurants don’t have the knowledge or patience to do: making everything from scratch. 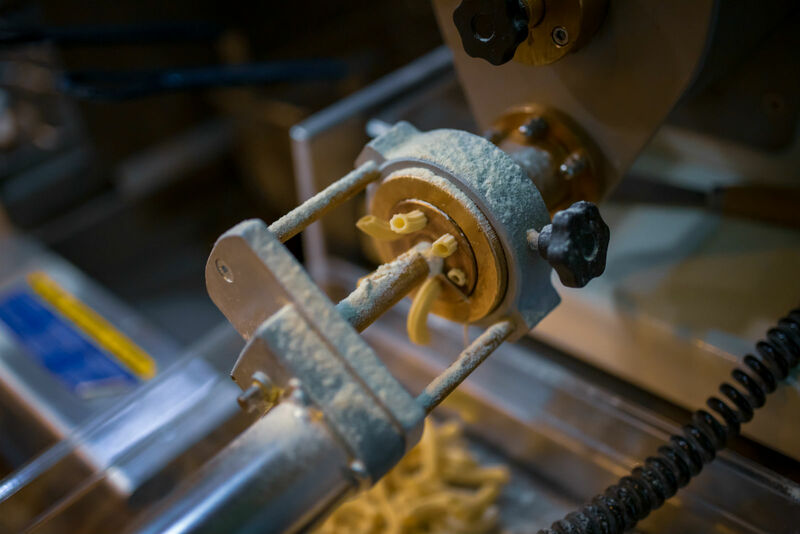 The pasta (in several different varieties) is made in house, as is the pizza dough and the ice cream. Even the tomato sauce is uniquely made by roasting tomatoes in their own wood-fired oven. And the effort comes through in every bite. The menu is a combination of classic Northern-Italian fare, pizzas, and elevated dishes from Donagrandi’s upbringing. While there are no shortage of kosher eateries that feature standard Italian-American red sauce food, Donagrandi and Subar are exposing their customers to a wider offering: fish crudo, croquettes, Calabrian chili oil, Instagram-worthy salads, and several different fishes, all prepared in their wood oven which is a focal point of the beautiful open kitchen. And when I say pizzas, I’m not talking about your average corner slice joint (though nothing against those). 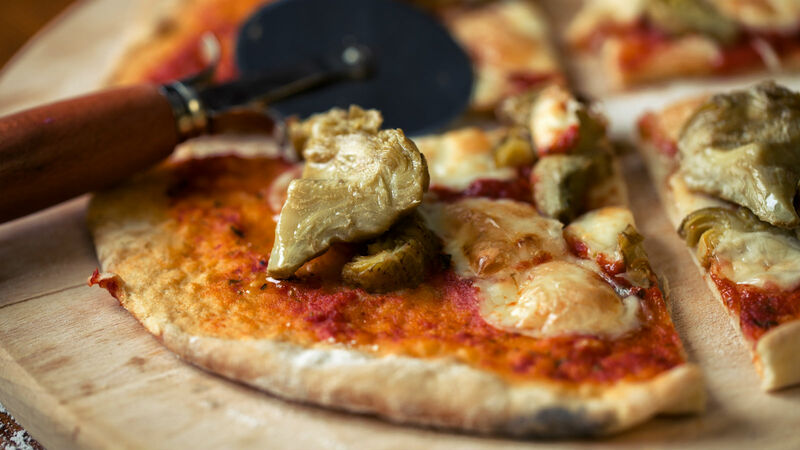 Abaita’s pizza uses a housemade, naturally-fermented pizza dough, which gives the crust that perfect, slightly blistered char around the edges when cooked in their wood oven. Of all the dishes I tasted at Abaita, it was the simple but perfect spaghetti with their house-roasted tomato sauce that I couldn’t get enough of. Silky and anything but boring, I really did feel at home. Look out for their ongoing special events, like a chef’s tasting Valentine’s Day dinner. Get ready to road trip for all the brisket you can eat.